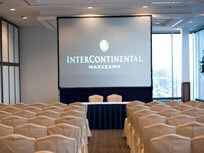 HIGH STYLE IN THE HEART OF THE CAPITAL The five-star InterContinental Warsaw is an impressive addition to the ever-expanding skyline. Located in the financial district opposite the Palace of Culture and Science, the hotel is a short distance from the main railway station, charming Old Town and the Warsaw Philharmonic. Well worth a visit are the Frederic Chopin Museum and Łazienki Park.